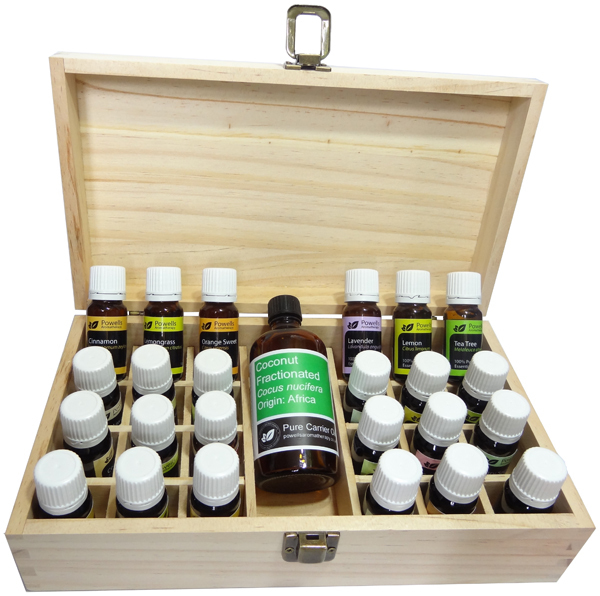 A full 10ml of each of the following 24 pure Essential Oils and one bottle of 100ml Fractionated Coconut Oil, supplied in a 24 slot hand-made wooden box, with a slot for the 100ml size bottle. This set has a saving of 10% if the same oils and box are bought individually! Contains the following oils: 100ml Coconut Oil, Lavender, Tea Tree, Eucalyptus, Peppermint, Rosemary, Ylang Ylang, Clary Sage, Geranium, Jasmin 5% Dilute), Sandalwood Amyris, Patchouli, Lemongrass, Orange Sweet, Basil, Cedarwood, Chamomile Roman 5% Dilute in grapeseed oil), Cinnamon, Frankincense, Grapefruit, Juniperberry, Marjoram Sweet, Pine, Rose (5% Dilute in grapeseed oil), Lemon.